“Arteroids is about cracking language open,” writes Jim Andrews about his aesthetic and poetic re-make of the classic video-game asteroids. Indeed, Arteroids provides an arena for a dynamic language that must be “played” if it is to be read, that must be operated upon if it is to be unlocked and understood. “Arteroids shifts the focus between game and play,” writes Andrews, “between text as readable literary object that gets its primary meaning from the meaning of the words to text as meaning via sound, motion, and destructive intent. When does “poetry” mean poetry, and when does it mean arteroid?” Arteroids stretches the definition of poetry to its limit, re-inscribing the genre into digital space where it can either thrive as a new and gamely form or cease to function within a process of annihilation created by the player. 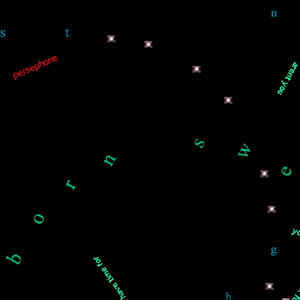 Yet, with Andrew’s added feature of “Word for Weirdos,” where the user is invited to compose their own text for the game space, Arteroids is embraced as a potential form for poetic creation, a page_space where the writer is challenged to create a text which functions according to a pre-defined set of characteristics (in this case the characteristics of the classic game asteroids). By way of “Word for Weirdos — which both Christina McPhee and Helen Thorington used in order to create texts for the space — Arteroids becomes its own a literary form and space that writers can explore in unique and productive ways.